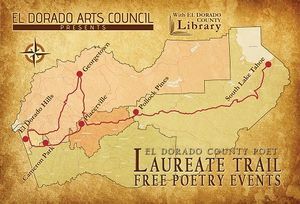 Join the new El Dorado County Poet Laureate Suzanne Roberts on a literary tour of the county. Roberts will be joined by local poets, Poetry Out Loud winners and special guests at El Dorado County Libraries in each district in the county for free poetry readings and events. All events are free to the public. Newly minted El Dorado County Poet Laureate Suzanne Roberts will visit each El Dorado County Library bringing readings, workshops, and other poetry-related events to its respective community. At each stop she will invite local poets to join in the program and finish up with Open Mic sessions for those who come out to the events and are inspired to share their work. The Placerville stop will include a free workshop with Roberts as well as selected readings from local poet and member of Red Foxes Underground Moira Magneson, and former El Dorado County Poet Laureate (2016-2018) Taylor Graham. South Lake Tahoe poet, travel writer, and educator Suzanne Roberts was presented to the El Dorado County Board of Supervisors on August 14, by District 5 Supervisor Sue Novasel as the El Dorado County Poet Laureate for 2018 – 2020. Roberts is the author of the award-winning memoir, Almost Somewhere (Bison Books, 2012), as well as four collections of poetry, most recently, Three Hours to Burn a Body: Poems on Travel. She was named “The Next Great Travel Writer” by National Geographic’s Traveler magazine, and her work has been published in many literary journals and magazines, including Creative Nonfiction, Brevity, River Teeth, Litro, and Zyzzyva. For more information visit www.eldoradoartscouncil.org or call 530-295-3496. Sponsored by El Dorado Arts Council and Friends of the Library.